Warlord Games gets on their bikes and rides with their latest releases for Bolt Action. Key to the campaign waged in the Western Desert was mobility in order to cross the vast sandy deserts. As a result both sides relied heavily on tanks and transports. 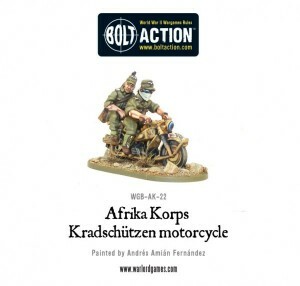 Amongst these were the BMW 75 and Zundapp motorcycles utilised by the Deutsche Afrika Korps and adding extra speed and manoeuvrability to your Afrika Korps force are these two new models.